Successfully Added Bluetooth Smart Watch Phone - GSM, Bluetooth 4.0, Music, Pedometer, Sedentary Reminder, Anti-loss, Heart Rate Monitor to your Shopping Cart. Stay connected throughout the day by bringing a smartphone to your wrist — with this handy and stylish round dial Bluetooth smart watch phone coming with GSM SIM card support, Pedometer, Sleep Monitor and more. 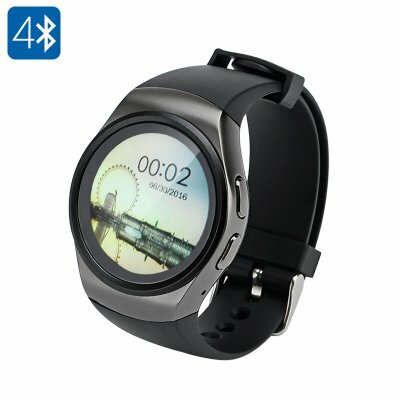 This round Bluetooth watch phone offers the ultimate convenience. With it, you can make and receive phone calls right on our wrist. Great for independent use or when you prefer not to take your phone out. It’s the perfect gadget to bring along on a camping trip or a hike. With IP65 waterproof rating, the smart watch is resistant to the elements and does really well in the rough outdoors. The watch offers even more features when paired to a smartphone. Simply connect it to your phone via Bluetooth and sync your messages and phone book, play music, use it as a remote camera trigger or anti-loss token. The GSM smart watch comes with a set of health features for a better and fitter lifestyle. Inspire yourself for more daily activity thanks to the watch’s built-in pedometer, track you reaction to exercise with heart rate monitor and make sure you get a good night’s sleep with sleep monitor. You will even have a sedentary reminder at your service to let you know when you’ve stayed too long at the desk. The Watch Phone is compatible with iOS 6.0 above and Android 4.4 above. The Bluetooth Smart Watch Phone comes with a 12 months warranty, brought to you by the leader in electronic devices as well as wholesale smart watch phones..